Being the smallest kid in class or even the skinniest person in room isn’t just about size. It is also about your confidence, stamina and strength. However, before hitting the gym, there are a few things you can work on which can help with bodybuilding- like eating right and getting optimum exercise. Here is a list of 6 best tips on how to build body at home without gym. Healthy food is the precursor to healthy body. Choose the right kind of food to eat at the right time in order to replenish lost nutrients immediately while keeping body fat to the correct required amount. Protein is the most important nutrient required to build muscles and must be consumed early morning, between meals and before and after exercise. Exercise must include full body workout and cardio. We are looking for ways on how to develop muscles without gym and running fits the bill for both cardio workout and full body workout. While protein is important, you must also get required amount of carbohydrate, vitamins and minerals. Eat three square meals a day. Eat one-fourth amount of protein, one-fourth amount of carbohydrates in the form of whole grain bread, one-eighth amount of fruits and the rest vegetables for vitamins and fiber. Snack on protein rich food like a glass of milk, a piece of cheese, or oats bars and fruits instead of chips, fries and other processed sugary foods. Good food combined with one hour of intense physical activity like running, swimming, walking and other complete body workout will help you with how to develop muscles without gym. Run for fifteen minutes; Increase the time in increments of five minutes as you build stamina. By the end of the month, you should be able to run for thirty minutes without getting drained. Running is how to develop muscles without gym. Start with a slow jog and gain speed. Pace your run with uniform strides to prevent early exhaustion and increased stamina. Do five squats at the beginning and increase the number to fifteen slowly as you build stamina. Stand with your feet parallel to each other and shoulder width apart. Raise your arms till they are parallel to the floor and parallel to each other. Keep your neck straight and look ahead. Pull your tailbone down and pull your abdominal muscles inside. This will ensure your back is straight. Bend your knees pushing your hip and buttocks back. Once your thighs are parallel to the floor, slowly straighten your knees and return to starting position. As you build more stamina over time, try to hold the squat for a few seconds up to half a minute. Do pushups, crunches, lunges, and triceps dips. Start with only two pushups. 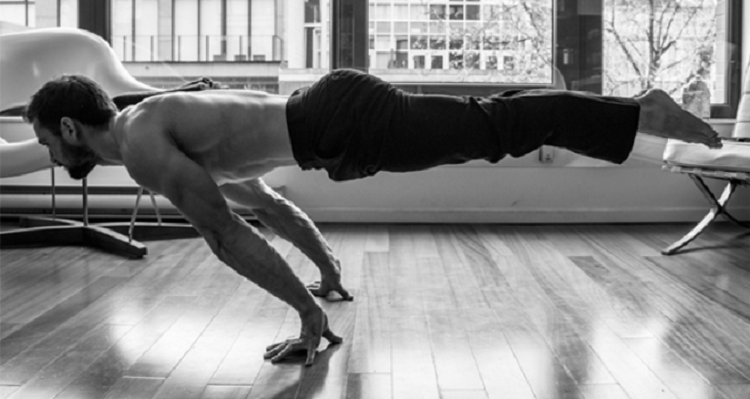 By the end of the month you should be able to do eight pushups. Ten push-ups a day is sufficient to build muscles at the right places and burn excess fat. When trying how to make body at home without gym and how to develop muscles without gym- do crunches at home. You do not need gym equipment-simply lie on your back on a mat or carpet. Bend your knees and slowly lift your shoulders off the mat keeping your neck straight. While lifting your shoulders off the mat, cross your arms across your chest or at the back of your head. Do not lift your back. You can do lunges holding dumbbells (or without holding them-since you are trying to develop muscles without gym, dumbbells may not be an option). Stand with your feet hip width apart and take a stride forward with your right leg and bend your left leg till your right thigh is parallel to the floor. Get back up and repeat with left leg. Do at least three lunges a day. When learning how to make body at home without gym-you can do triceps dips using a wooden chair. Sit at the edge of the chair and rest your palms at the edge. Ease off the chair and go down piling your weight on your arms with palms pressed to the chair. Once you sit on the floor, come back up slowly all the time placing your weight on your arms. If you have never exercised before and are looking for how to make body at home without gym, you can start with brisk walking. Walk for fifteen minutes on the first day. On the third day walk for twenty minutes. Walk briskly and mindfully. Take uniform strides and inhale and exhale completely. Count to four while your inhale and count back to one from six while your exhale. As your exhalation gets slower-you are more relaxed and you will burn more calories in a given amount of time. Pay attention to your breath while you brisk walk to maximize the benefit or the cardio vascular routine. By the end of the month, you would have developed a lean muscle mass; you would also have upped your walking time to one hour. Your stamina will be improved and you will be able to run easily. Replace trans fats in your food with food rich in omega 3 fatty acids. This will not only help keep your heart healthy but also help protein synthesis. Food rich in omega 3 fatty acids includes fatty fish like wild salmon and tuna, nuts like almonds and walnuts, seeds like safflower, flaxseeds, canola and sunflower. Use vegetable oils in cooking instead of bacon and duck fat. You could also use coconut oil. It is not just the latest fad but is rich in all essential nutrients and burns calories fast. You are looking to learn how to make body at home without gym, go no further than eating right and exercising everyday. Sleep is essential for regulating body temperature, keeping digestive system working smoothly, and replenishing lost fluids, nutrients and protein. Sleep at least for five hours at night and nap for fifteen minutes after the midday meal. Once you start walking, any disturbances in sleep are also corrected improving your mental health along with helping you build your body. Workout is almost as important as eating right especially if you are looking for how to develop muscles without gym. Make sure you get enough protein throughout the day. While snacking between meals on nuts, cheese and other protein rich food is important, starving to burn calories and excessive fasting is a big no-no. Replenish protein with protein shakes and protein rich snacks before and after each workout.